Federal Interior Ministry has issued the notification of Dawn Leaks scandal investigation, reported Waqt News. 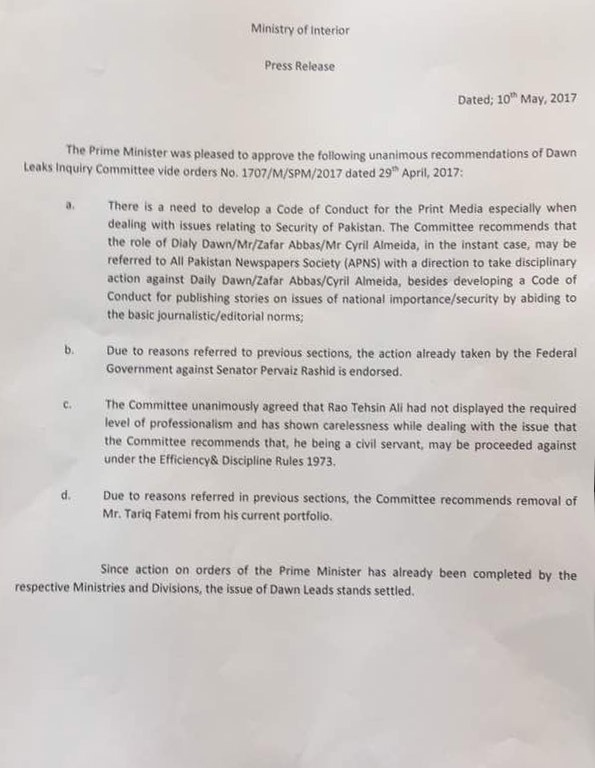 The notification stated that Tariq Fatemi has already been removed from the office while Rao Tehseen worked ‘irresponsibly’ during the issue. Furthermore, the notification asked for necessary action against reporter and editor of newspaper. Federal government has already taken action against former Information Minister Pervaiz Rasheed, mentioned the notification. Prime Minister Nawaz Sharif approved four suggestions of Dawn Leaks notification on 29th April. This notification is same as released last month and nothing new is being add in it. As the premier has already signed the notification and completed by the respective Ministries and Divisions, the issue of Dawn Leaks stands settled, stated the ministry.